A sight which is also in the list of the “official” unseen Thailand sight is the temple Wat Bang Kung (วัดบางกุ้ง) in Amphawa district, Samut Songkhram. 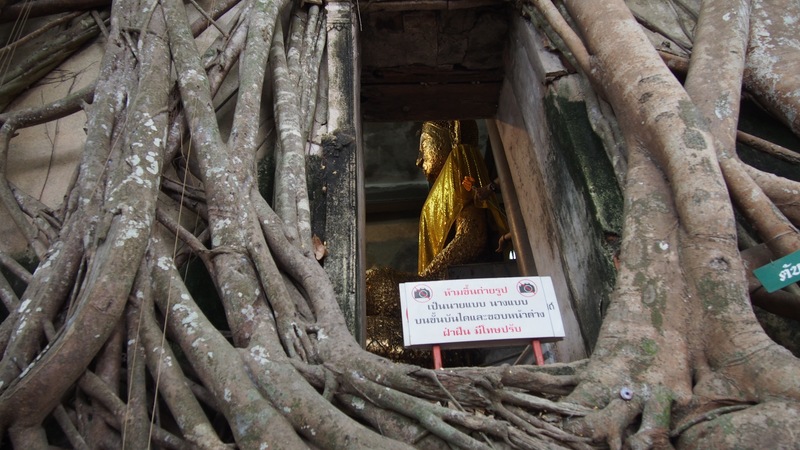 The main attraction of the temple is the chapel overgrown by a Banyan tree. Except at the behind, the roots almost completely cover the building so it is hardly recognizable as such. Thus the chapel is normally know as Bot Prok Pho (โบสถ์ปรกโพธิ์), ordination hall covered by Bodhi tree, even though the actual name of it is Bot Luangpho Dam (โบสถ์หลวงพ่อดำ). Inside the chapel is a large Buddha statue, and of course every visitor is praying and placing incense sticks, rubbing gold leaves and so on. However this chapel isn’t the only important place of the compound. In fact, this temple is an historical significant place, as it was the camp of king Taksin during an attack by the Burmese army in 1768. However after the successful campaign the site was abandoned for almost 200 years, until in 1967 it was redeveloped by the Ministry of Education. However I did not read about the historical significance of the place before, so I focused my photography on the chapel. The most easy thing to notice are the two rows of muay thai statues, there are also statues of soldiers in the dress of the 18th century amid cannons and bushes cut into the shape of horses, and in the middle a statue of king Taksin. This is all still right next to the chapel, but actually the temple extends on the other side of the street as well till the shore of the Mae Klong river. There it has the pier to enter the temple on a river tour – which we did not do because for the Thai family it was too hot. The cannon above is next to that pier, protecting the temple in the past. As usual at all sights near a river or lake it has fish food on sale and it has many feeding the fish there. It also has a small zoo there, some birds, a monkey, nothing really spectacular but nevertheless our small daughter liked it a lot. One oddity in my eyes was the fence around this part of the temple – on each of the fence post it has a figure in uniform, mostly soldiers and policemen.